All I needed was new batteries for the mouse. What a relief and surprise--beyond rebooting, computer fixes are never that fast and easy. So I will be up and blogging again tomorrow, for sure. We are dining tonight at an old favorite downtown that we haven't worked into the rotation in too long -- Local 127 -- and I look forward to sharing an up to the minute take on what Steve Geddes and crew are up to this summer. My mouse stopped working. Using the iPad to troubleshoot the device failed to help. 'Course, I can use the Pad for some apps but not really to get my work done -- and not to do a proper blog post, either. Oh well....to be dealt with sometime soon, I suppose. Thanks to La Poste for the lovely re-opening reception last night. What a spread -- beef tenderloin, smoked salmon, steamed mussels, sauteed whole mushrooms, excellent cheeses and much more... not to mention a lively, engaging crowd of interesting people from all over the area. The evening reminded me why this restaurant has got to be the best non-downtown or OTR dining spot in the metro, or at the very least, one of the best. We Cliftonites are so lucky to have this gem in our 'hood -- just around the corner from our other blessed neighbor, the Esquire Theater. Yes, we'd love to have a grocery store back, but in lieu of that, thank goodness for La Poste & the Esquire. Seriously though, what other Cincinnati neighborhood(s) have a restaurant that can compete in quality with La Poste? 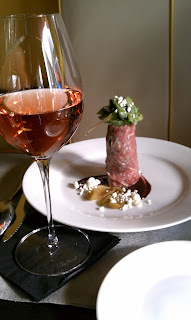 Enoteca Emilia springs to mind as a wonderful addition to O'Bryonville -- major props to that establishment for elevating in-town, non-downtown or OTR dining. I'm hard pressed to think of anything comparable in Hyde Park, which is full of chain restaurants of acceptable quality but no independent stars. Am I missing something? If anyone has a neighborhood favorite -- not counting pizza parlors, tacquerias, burrito dens, etc -- please leave a comment. Oh, if you go across the Ohio there's also Bouquet in Covington. What else? 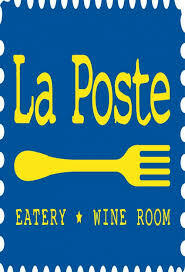 La Poste WILL reopen tonight, on schedule! I had a call this morning from the restaurant's general manager, who says the staff will be "working our tails off" today to finish up the remodeling and hold the welcome-back reception this evening. Yay! [Kelly also said that they had taken down the reception announcement temporarily so they could wash the windows.] My sincere apologies for misreading the "signs" and concluding that they couldn't possibly be ready to open tonight. So Clifton's best restaurant LA POSTE will hold a reception tonight, from 6-8 PM, including a spread of complimentary food and wine as they showcase the newly spiffed up interior. As a huge fan and "regular" customer, I'm planning to be there. This recipe suggests a "cherry-scented" red wine to accompany it, but it doesn't say what that might mean. I guess some pinot noirs can be cherry-like -- especially those from parts of California. And while it's not too cherry-ish, I think a cru Beaujolais (such as Morgon or Brouilly) would also pair wonderfully well. In any case, this makes a nice burger. Preheat the oven to 375°. Arrange the garlic halves cut side up on a sheet of foil, drizzle with olive oil and wrap tightly. Roast until the garlic is very tender, about 1 hour. Let cool, then squeeze the cloves out of their skins into a small bowl and mash to a paste. Bring a saucepan of salted water to a boil. Put the asparagus in a strainer, submerge it in the water and cook just until crisp-tender, 2 minutes. Cool the asparagus under running water and pat dry. Return the water to a boil. Add the fregola and cook until very tender, about 20 minutes. Drain well and let cool slightly. In a food processor, puree the garlic paste, fregola, chickpeas and the 2 tablespoons of olive oil; transfer the mixture to a bowl. Stir in the asparagus, artichokes, olives, scallions, yogurt, lemon juice, herbs and quinoa. Season with salt and pepper. Heat a large cast-iron griddle or skillet and brush with olive oil. Using lightly moistened hands, form the mixture into eight 3-inch patties. Brush the patties with oil and cook over high heat until golden on the bottom, 4 minutes. Flip the patties and top each with a slice of cheese. Reduce the heat to moderate, cover and cook until the patties are heated through and golden on the bottom and the cheese is melted. 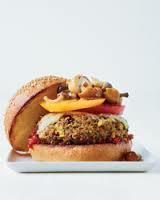 Set the burgers on the buns and top with lettuce and sliced tomatoes, or other toppings of your choice. I'm crazy about (chicken and/or seafood) gumbo, but only when okra is in season. It's the one key ingredient without which you don't have gumbo, and it just doesn't work for me to use frozen okra. Well, that time has come: plenty of fresh okra is at farmers’ markets now. I know that okra can be a hard veggie to love, but if you cook it separately (sautéed) to remove the gooey “ropes,” you’ll probably enjoy it as much as I do in a dish such as this one. Gumbo is a bit of a project with lots of steps, so I only make it once or twice per summer. But my recipe makes a large potful, enough for several meals. The finished stew freezes quite well. My usual recipe uses chicken and shrimp, but the past couple of summers I’ve added a less healthful but delicious extra—(chicken) Andouille sausage. I just use one large sausage and it ramps up the flavor beautifully. If you want, go ahead and use pork Andouille, and put in as much as you feel like. The recipe below calls for two chicken sausages (from Trader Joe’s), but you can make it one, or omit the sausage altogether to be a better "healthy foodie." 1. Heat 2T oil/butter over medium-high heat in a skillet. Add okra and sauté, stirring often, for about 8-10 minutes. Set aside. 2. Heat remaining oil in a large Dutch oven over medium-high heat. Add pepper, garlic and onion and sauté until veggies turn translucent, about 5 minutes. OPTIONAL: Stir in 1-2 Andouille sausages, sliced and sautéed first in a small frying pan. 3. Stir in flour and cook, stirring, for 2 minutes. Add chicken stock, tomatoes, herbs, salt, and reserved okra. 4. Bring to a boil, cover and reduce heat to low. Simmer for 15-20 minutes. 5. Stir in shrimp, chicken and/or crabmeat, cover and cook another 5-10 minutes until meat is tender. Be careful not to overcook shrimp. 6. Remove from heat. Discard bay leaf, stir in lemon juice, Worcestershire and hot sauces. Add more salt if necessary. 7. Ladle into bowls over white or brown rice. Pass more hot sauce at the table. Gazpacho: Let me count the ways! While we're still enjoying peak tomato-- and other produce -- season, let's not forget the pleasures of a well made cold, spicy soup. Gazpacho also is a veggie plate in a bowl and super healthy. Traditional recipes often use bread as an ingredient in the blended soup, but there are many other ways to make it. I was reminded of the versatility of gazpacho by this article in the Health section of the Times last week, which has links to a variety of riffs on this summer standby, most made in a blender but others just chopped veggies in some kind of juice -- or the veggies' own juices. Included are such delights as Chipotle Gazpacho; Tomatillo, Tomato and Avocado Gazpacho; and Blender Gazpacho with Celery, Carrot, Cucumber and Red Pepper ("essentially a tangy, pungent vegetable smoothie"). Here's one of the recipes! 1. Put the onion slices in a bowl, cover with cold water and add a few drops of vinegar. Let sit for 5 minutes while you prepare the remaining ingredients. Drain and rinse with cold water. Cut in half or into smaller pieces. 2. Working in two batches, blend all of the ingredients except the garnishes in a blender for 2 minutes or longer, until smooth and frothy. Transfer to a bowl or container (a metal bowl is the most efficient for chilling), thin out with more water if desired, and chill for at least 2 hours before eating. Garnish each bowl or glass with diced cucumber and slivered fresh mint leaves. We didn't go there for the dining but to visit friends. And we didn't make too many plans in advance or really check out the restaurant scene. But here's a quick tip: the most interesting part of the town is an area within walking distance of the central business district called The Strip. It's about a 10-block area mostly on Penn Avenue, between about 15th Street and 25th Street, full of shops and ethnic grocery stores. On weekends, the parking lots fill up with local farmers and other vendors selling home grown and hand-made goodies. The coolest thing about this area, in our opinion, is the ethnic variety of the grocery stores and bakeries. There are a couple of terrific Italian markets, along with a few Italian eateries. You'll also find a large Asian grocery store and -- my favorite -- a Spanish/Mexican/Latin market on the corner of Penn and 21st Street that makes fresh tortillas daily. You can't get that in Cincinnati, to my knowledge, so we stocked up on a few dozen corn tortillas (supposedly they will freeze well) and a couple of other Latin treats. Here are a couple of photos from our dinner at Vallozzi's -- a salad featuring grilled artichokes and ravioli with short ribs and truffle oil. Both were yummy! August 5-11 is Downtown Cincinnati Restaurant Week. You can find a list of participating establishments by clicking here. We decided to try the new rooftop bar at 21C Hotel and then partake of the special menu at Metropole, the hotel's excellent restaurant. It had been a while since we'd fit Metropole into our dining schedule, and we were reminded that it's really one of our favorites. We started the evening at the cocktail bar on the 11th floor, which was far less crowded than it usually is, according to the staff and what I've heard about the popularity of the spot. We hit it on a Tuesday at about 6:30-7:30, which was a nice time to go. Downstairs at Metropole, our Restaurant Week menu choices were limited to either of two appetizers -- a simple green salad or seared octopus -- we selected the latter, pictured here. Main course selections are Chickpea Panisse (hard to describe -- vegetarian, with summer veggies and an olive puree); Seared Monkfish (with tomatoes, gnocchi and fennel) or Braised Pork Shoulder (with polenta and zucchini). We avoided the meat and each had one of the other entrees; both were good. For dessert, no choice -- just the Dark Chocolate Tart, which was an interesting combination of flavors (it included sea salt, olive oil, white chocolate ice cream and candied olive -- very unusual!). I also enjoyed some of their French press coffee with the tart. While Restaurant Week is a great way to get people in the door, I think it's best viewed as an introduction to (or reminder about) some of the city's best offerings. Once you see the regular menu -- at least at Metropole -- you'll likely want to come back and have a chance to partake of the whole range of intriguing choices. This works at any of the participating eateries, of course, but I think you'll be especially interested in what Metropole is dishing out. It drives me a little nutty when I see people cutting out or severely limiting fruit and some veggies, such as carrots, when they're trying to maintain a healthy weight. Seriously, folks, you aren't going to get fat eating bananas or carrots. Know what I mean? 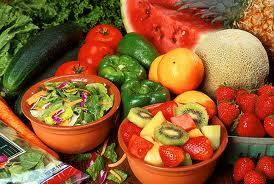 Below are excerpts from an enlightening piece about why we shouldn't avoid fresh fruit. That's got to be good news as we enjoy the terrific produce now and for the next few months. Whole fruits, he explained, contain a bounty of antioxidants and healthful nutrients, and their cellular scaffolding, made of fiber, makes us feel full and provides other metabolic benefits. When you bite into an apple, for example, the fruit’s fiber helps slow your absorption of fructose, the main sugar in most fruits. But fiber is not the full story. . . .
Fruit can also help keep us from overeating, Dr. Ludwig said, by making us feel fuller. Unlike processed foods, which are usually digested in the first few feet of our intestines, fiber-rich fruit breaks down more slowly so it travels far longer through the digestive tract, triggering the satiety hormones that tend to cluster further down the small intestines. . . . .
[But experts] caution against choosing juice over whole fruit. While the best juice has nothing added, nothing subtracted, some important changes take place when you turn fruit into liquid. . . . If you opt for juice, tossing whole fruit in a blender rather than squeezing it offers the best chance of retaining most of the fiber, vitamins and minerals. Dried fruits also hold one of the main disadvantages of juices: volume. Dried fruit essentially concentrates the calories and sugar into smaller packets, making it easier to consume excess calories. But dried fruit is better than juice. . .because it preserves the fruit’s cellular structure, along with the health assets that provides. Here's a really yummy summer salad that takes advantage of summer's bounty, using ripe peaches, peak-season blueberries, as well as a few radishes -- which I love but hardly know what to do with. My husband, who disses salads much of the time, had three helpings and graded it A+. 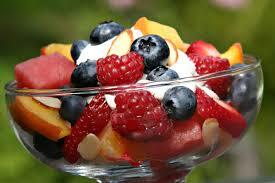 Those sweet peaches and berries ought to make anyone swoon. Slice the onion as thinly as possible. Place sliced onions in a bowl of ice water for 5-10 minutes to remove any sharp flavor. Drain and pat dry. Cut peaches in half and then slice thinly. Place onions, peaches, radishes, blueberries and basil in a large bowl and toss with the vinaigrette. Add salt and pepper, if desired, to taste. When serving, top each portion with some of the cheese and nuts. Note: If you want, toss the finished product (before adding cheese and nuts) with some lettuce or baby spinach.